Last night’s Democratic gubernatorial debate brought me face-to-face with the horrifying realization that Illinois Dems spent the better part of the last decade behaving like Republicans. I’ve had this realization before—and I'll probably have it again. It's a hard realization to ignore when the Democratic candidates point it out again and again, as they did in last night's debate in a rather obvious effort to win over voters like me. Most of the reminding came from the three front-runners—J.B. 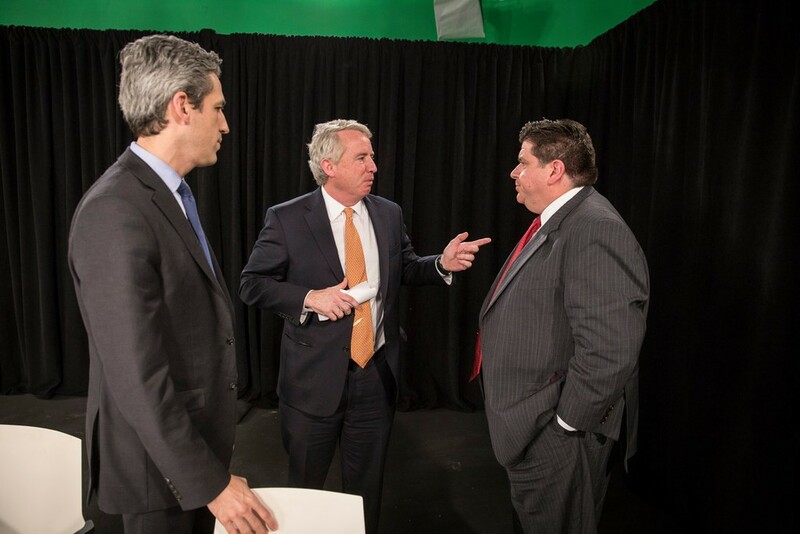 Pritzker, Chris Kennedy, and state senator Daniel Biss—in the form of accusations that the other guys had sold out Democratic values. The message was reinforced even after the debate when I discovered several e-mails from the campaigns essentially carrying on the same attacks. Pritzker launched the most e-mail attacks because—let's face it, as the only billionaire in this primary, he's got the most money to (a) hire researchers to dig up sludge and (b) pay someone to e-mail it to people like me. So Pritzker sent me an e-mail pointing out that Biss had voted to support charter schools, thus diverting money from public ones. That reminded me that the charter school movement was, to a large degree, abetted by Barack Obama and other self-proclaimed progressives (including the Pritzker family) who were looking for ways to distance themselves from the teachers' union, which despises charters largely cause they're anti-union. It was part of Obama's larger strategy to look for ways to win over suburban swing voters who say they're liberal on social issues but conservative on economic ones. Meaning—they don't mind paying for the public schools their kids attend, but don't like paying taxes for the other kids. Also thanks to Pritzker, I got a reminder that back in 2011 Biss voted to give a tax break to the Chicago Mercantile Exchange. Well, as long as you got me going on the subject, let me point out that . . . It was a tax break the state couldn’t really afford and CME didn’t really need. It was supported by the leaders of the state's Democratic party: house speaker Michael Madigan, senate president John Cullerton, and Mayor Rahm Emanuel. And it came just a few weeks after Mayor Rahm arm-twisted the city council into unanimously voting to close mental health clinics in some of our poorest, most high-crime communities. So there was no money for our most vulnerable citizens and lots of money for our richest ones. Also, there wasn't a peep of protest about the CME tax hike, much less the mental health clinic closings, from Pritzker, Kennedy, or any of the other Democrats in the race. I also got an e-mail from Pritzker pointing out that Biss had supported cuts for state pensioners. Then I got an e-mail from Biss pointing out that Pritzker had donated to a PAC whose mission was to make even more pension cuts. By then I was ready to hit the whiskey I keep in that supercool flask with Prince on the front that I bought from the Kaleidoscope Kollective on a recent trip to LA. Hold on—time to take another hit. Ah . . .
Biss, Pritzker, and Kennedy have vowed that they have put their old Republican ways behind them. I'm still waiting for Rahm to make a similar pledge. And waiting. And waiting. And waiting . . . If I’m wrong, the Prince flask will come in handy. Adeshina Emmanuel decodes J.B. Pritzker's wiretapped conversation about the "African-American thing." Also, a homeless couple is suing the city for removing their tents.